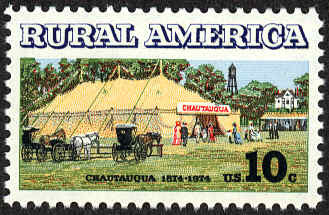 Chautauqua (roughly pronounced ‘je-taw-kwa’) was a popular national movement that fused education and entertainment. Its origins lie in educational gatherings at Lake Chautauqua, New York in 1874 and organized by businessman Lewis Miller and religious educator John Heyl Vincent. Their objective: train Sunday school teachers in a pleasant summer setting. The Chautauqua Sunday School Assembly would soon offer its programs to the general public and include lectures on politics, discussions of the social order, home study groups, national and international musical presentations, and other entertainment. Canby introduced the first session in Oregon in 1885, but it was held for one year only. Apparently eight years passed before Oregon City (known as the Gladstone Chautauqua) and Ashland renewed interest and held camp meetings outdoors. The Chautauqua Literary Society organized in Hillsboro in 1894. Early on, the activity was slower in getting started in the Pacific Northwest because of great distances between towns and higher transportation costs. In 1913 the Ellison-White Chautauqua System of Portland established a circuit of 42 regional cities that was an immediate financial and learning success. As the major booking agency for the West Coast, it ensured that within four years, every community either sponsored a series or had easy access to one. Beaverton, population 600, hosted a five-day Chautauqua Festival in 1920 under the auspices of Ellison-White that illustrates Chautauqua ideals. Opening night, a Friday, featured the McCords, a duet of music, impersonations, and monologs. Chinese lecturer Woon Young Chung on Saturday spoke on the Japanese encroachment of his homeland. The Alexander Trio gave a vocal and instrumental concert on Monday and on Tuesday, J.C. Herbsman, a lecturer with “punch, pep and purpose” addressed the audience on the duty of an individual to community, country, and humanity. For the closing performance, five Maori singers from New Zealand offered “An Evening in the South Seas.” No programs were held on Sunday. Daily admission to the series, held in the Beaverton High School auditorium, was 50¢ or 77¢, depending on the presentation. The war tax was 5¢ or 8 ¢. Note: The federal government had earlier instituted a 10% war tax to pay down the huge debt accrued by World War I. The U.S. Treasury Department however ruled in 1921 that Chautauqua was not subject to the levy because of its educational, non-profit status. The same year Forest Grove’s Prune Chautauqua offered lectures by orchardists and tours of orchards, areas of special interest to Beaverton prune farmers. The conference also set wages for pickers—10¢ per box or 50¢ per hour– and commercial drying–$50 per ton. By the late 1920s times were changing and attendance was dropping. Movies, commercial radio broadcasts, and increased auto travel temporarily ended the era of circuit or tent Chautauquas. The 1970s saw its national return as a vibrant arts and lecture program and it continues to thrive today including at our own city library.